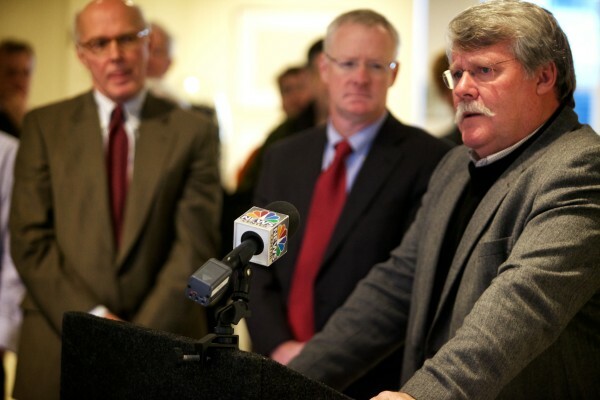 Former state Sen. Dennis Damon speaks at a press conference in Portland expressing disappointment in EqualityMaine's endorsement of Mike Michaud for governor instead of Eliot Cutler in this January 2014 file photo. Like Tony Brinkley, I supported Eliot Cutler for governor in 2010. Unlike professor Brinkley, who penned a July 6 BDN OpEd, I am supporting him again in 2014. Four years ago, Maine, like the rest of the country, was struggling economically. My political instinct told me it was unlikely a Democrat would be elected our next governor. As a life-long Democrat, that disappointed me and caused me personal anxiety. In 2010, Maine needed a leader who could make tough decisions while also understanding the plight of those among us with the greatest need. We needed a leader who, while dealing with the difficulties of the present, had a vision for Maine’s future and was able to maintain that vision, explain it to us, and inspire us to strive for it. I found that leader in Cutler. Understandably, the outcome of the 2010 gubernatorial election disappointed me, and the resulting four years have equally disappointed many Mainers. To me, it seems that for every decision made to stabilize our listing ship of state, countless other decisions had unnecessarily dire consequences. And then there were the “comments.” To have my state become the laughingstock of America is beyond embarrassing. It’s untenable. It is time for a change in leadership at the top. Brinkley’s OpEd criticized Cutler for not leading. Specifically, the opinion cited “OneMaine,” an organization conceived by Cutler as a way to educate voters on the dangers of legislative divides that become so wide and deep as to prevent reasonable solutions to the challenges facing us. His hope was that the Maine Legislature would become populated with legislators who, regardless of their own partisan affiliation, would be willing to check their party obligations at the door when necessary and would find a way to reach consensus on the big issues important to Maine. Cutler initially served on the board of directors of OneMaine. He left the board when it became apparent that the work of the organization was being attacked and criticized by party demagogues as simply a platform for his 2014 campaign for governor. OneMaine exists today and, though less robust than it was three years ago, is still committed to its original mission of education and support. OneMaine has convened 10 “OneTables.” These discussions have been held throughout Maine on topics of importance to Democrats, Republicans, Greens and independents alike. Topics included health care, charter school implementation, money in politics, rural economic development, transportation, higher education, innovative economy, energy efficiency and heating assistance and downtown revitalization. An offshoot of OneMaine, “OneHancock,” has emerged and is conducting activities using the same concepts developed by OneMaine. OneHancock is currently working with the Community Benefit Fund, developed and administered by the Hancock County Commissioners from wind power proceeds, to help Hancock County towns provide heating and power assistance to those in need. Leadership is a quality that has long interested me. I know there are seminars on it, books written about it, and money spent on trying to acquire it, but over the years I have come to see it as a quality you have or you don’t. Some people attempt to lead by bullying, some by being everybody’s friend and some by being all things to all people. None of them are true leaders. Since the last election, Cutler has taken stands on issues that are important to Maine. He has written a book, “A State of Opportunity,” and subsequent white papers detailing his specific plans. He has spoken with groups across the length and breadth of Maine about the economy, political gridlock, election reform and his vision for Maine. He has publicly commented on many of the current administration’s positions. Cutler has proven he is anything but a failed leader. He has been vilified for leading and for not leading. Because of his extraordinary leadership, he has become a target of naysayers’ criticisms and a threat to party self interests. I see him as every bit the leader I thought him to be four years ago and need him to be for Maine’s future now. Dennis Damon is a former Democratic state senator from Hancock County. He resides in Trenton and is the current executive director of OneMaine as well as a member of OneHancock.